A singing gathering hosted by Seabury Gould similar to the "Song Circle" which Seabury hosted for many years in Arcata. Singers are encouraged to bring the songbook "Rise Up Singing" and copies of songs they would like to share. In "Song Village" there is the singing of folk songs and other songs conducive to group singing. An idea for "Song Village" is to also have themes which Seabury and the participants may suggest, such as songs by a particular musician or songs that convey hope and peace. A second part to the afternoon is "Music Improv Circle" in which Seabury facilitates musical improvisations with a variety of musicians at Westhaven Center for the Arts from 3.15- 5.15 p.m. Depending on who shows up, Seabury leads the group in eclectic forms of improvisation ranging from Indian to Traditional/Folk music. Players of any instrument who would like to explore improvisation are invited to participate. Admission is free. 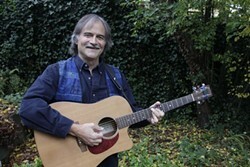 For information about Seabury Gould, Song Village and Music Improv Circle, see seaburygould.com or call 707-845-8167.